One of the pleasures I have had in this field is meeting the owner/ operators of many of the businesses making our fine embroidery materials. One of the most common misconceptions I find among my students is the size of these manufacturers. We are accustomed to assuming everyone is a large, faceless company with so many of our products being produced on assembly lines in very far away places. This is far from the truth for needlework supplies, where even the biggest names are family owned with less than a dozen employees. The vast majority of businesses are less than five artisans strong and have been working for decades, making their knowledge vast but their future unsure. For this reason, I have coined them 'Artisan Manufacturers'. These are businesses which are centered around the passion of their owners and craftsmen and are more like endangered species than big business. I want to introduce some of my favorites. I hope you will support them in their struggle to keep fine materials available to those of us who enjoy needlework. 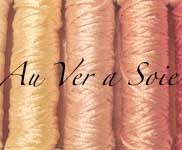 Established by 1875, Au Ver a Soie is still owned by the Boucher family. Marc Boucher is the latest in a line of experts in converting silk into a range of high quality filament and spun silk threads. With over 500 colors in their inventory, they provide the most extensive line of subtle shade in the world. I visited their factory in Paris a few years ago where I was surprised that Marc plies his trade on the third floor of an old Arts and Craft Era building near the fashion center of Paris and not some large corporate complex. Staffed by a handful of experts they provide luxurious threads to the enthusiast and the couture embroiderer alike. Marc told me that these "Ancient businesses" in France were endangered and he appreciated the American embroiderers enthusiasm for his product line. Now a subsidiary of Toye, Kenning and Spencer Ltd., Benton and Johnson has been making real gold threads since the 1700's. Their project line is extensive but due to the lack of demand for gold threads, often they are made to order. Along with Golden Threads, they are the last gold thread makers in England with a wealth of history in their memory banks and some valuable turn of the century machines. A handful of people still ply the trade in the middle of England. 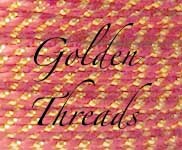 Neil, the managing director has been extremely helpful in determining what gold threads in their inventory would be best for lace making and has made speciality threads for some of my licensed museum kits. 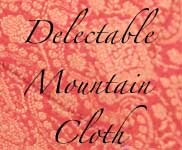 Unlike the other companies on this list, Delectable Mountain Cloth is a retail business with a twist. Jan, the owner, has searched the world for years to bring together the highest quality silks in one store. Displayed by color, walking into the store in Brattleboro, Vt is a virtual 'candy store' for those who love fine fabrics. 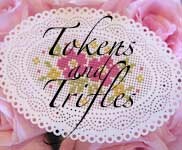 Jan is always on the lookout for tiny patterned silks for those of us who make dolls and finish embroidery, making her a great place to visit. While you can buy her fabrics on-line, she is happy to receive a letter with a snip of linen and threads and send you back a few squares of Duponi as suggested matches for you to choose from. Not only a great 'secret source' for silk, Jan is one of those rare people passionate about silk. She has developed deep friendships in Thailand and India with silk distributors. They will often take her into the home workshops of the weavers and she will see, as she describes it, "the most luminous brocaded silk ever on the loom, never to be made again". Tearing up, she told me she almost always has to buy it directly off the loom saying that the silk is so beautiful it makes you cry. I supply over 50% of my kits with these silks she brings back. 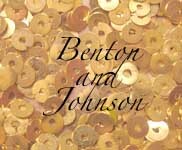 Formerly the Managing Director of Benton and Johnson, Bill Barnes decided to continue to make gold threads during his retirement. Bill comes from a long line of individuals who worked in the gold threads industry and reminisces about sitting at the gold spinners knees when he was a child. Bill has been an instrumental partner in bringing back 17th century threads for the Plimoth Embroidered Jacket project. He has made gilt sylke twist (wire wrapped silk), silk-cored gold thread, and silk purl (silk covered wire in a spring shape) for myself and Access Commodities to further this and other reproduction projects. I started this manufacturing company in 2005 with Wendy White and Justyna Teverovsky. Both Wendy and I had independently been collecting decorative edged perforated paper from the mid-1800's for years, both thinking 'geez why doesn't anyone make this delicate stuff again?'. We were antiquing one day together and I caught sight of a piece and bought it, upon which we realized that we both collected and discussed our thoughts about the sad disappearance of this wonderful embroidery supply. Wendy challenged me, saying 'you are an engineer - figure it out!'. We researched the techniques of the past and were able to bring back this fine count perforated paper. We are driven by three goals - (1) making something we want to embroider with, (2) providing a product that can be used by older embroiderers as their eyes age which still has the elegance of linen and (3) encouraging the next generation to pick up a needle and cross-stitch as their first step into embroidery. The three of us manage every facet of the business with titles like 'chief bundle clerk', 'web guru', and 'packaging lady'. We are typical of most manufacturers, very small and managing the business ourselves while also working other jobs because we are passionate about making something wonderful available to all.